A small inflatable rubber dinghy approaches the coast of Lesbos loaded with refugees through crossing from Turkey, September 2015. Debets/Press Association. All rights reserved. On February 23 this year, I had the pleasure to be in Brussels for the event “CEPS Lab – Reconstructing the Union” as a discussion leader, and in my panel “Rights & Security” we discussed a topic central to our era: migration and effective ways to eradicate smuggling. Despite different opinions and perspectives there was a general agreement that alternatives to the deadly sea journey need to be established as soon as possible. As long as EU Member States as a whole do not offer safe and legal ways to reach Europe, smugglers’ business will continue to thrive, as they continue to conduct their activities with no respect for basic human rights or international law. So far, Europe has been mostly focused on stopping migration flows, along with policing and border control. Due to our perspective at the forefront of the migration crisis at sea, at MOAS we constantly deal with the immediate and most terrible effects of human smuggling. The people we rescue are increasingly reporting having been exploited, abused, beaten, kidnapped for ransom or tortured along the journey from their country of origin to the Libyan coast. We cannot ignore this awful reality. Humanitarian conditions are also deteriorating in Libya where people held in detention camps are victims of physical and psychological abuses, sexual violence, inhuman treatment and other human rights violations. Migrants reporting forced labour and arbitrary detention with no access to lawyers or legal assistance are also on the increase. Last year, we dealt with an unprecedented number of injuries and psychological traumas spread among the people we helped, due to the abuses they had suffered at the hands of smugglers and human traffickers. This situation suggests a greater level of systematization and industrialization among smuggling networks than in the past, with more actors competing to maximize their opportunities and to meet the demand. Worth mentioning is also a change in smuggling practices. In 2014, on an inflatable boat we would find around 75-80 people, while last year MOAS' team rescued up to 120-150 people per boat. Also, we see the number of people packed onto wooden boats increasing, and their condition worsening year on year. 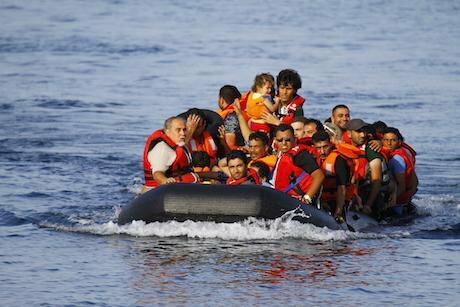 On average 50 or 60 more people are packed on the same boat nowadays compared to the past. In my view, in order to defeat the smuggling business the first option has to be to create efficient alternatives and eradicate their networks through the implementation of humanitarian corridors and resettlement policies. For this reason, we strongly believe that the focus of the EU should be on humanitarian efforts, rather than just preventing people from getting to Europe. Smuggling networks have industrialized despite Europe’s efforts to stop the flow by building walls and raising fences along its external and internal borders. This approach has brought no long-term solution to the current humanitarian crisis. MOAS proposes the creation of valid alternatives to uncontrolled migration flows through the establishment of safe and legal routes. MOAS proposes the creation of valid alternatives to uncontrolled migration flows through the establishment of safe and legal routes. A large-scale implementation of this model would help to eradicate smuggling networks, as it will provide vulnerable people with legal access to European soil. Moreover, it will increase our safety and security since eligible candidates would be assessed in advance. A second option is a better implementation of the resettlement policy. This would allow a more rational distribution of asylum seekers and refugees within Europe with the ultimate goal of integrating them in our shared community. I personally devote special attention to this policy since it is one of the best ways to avoid the trafficking of women. Women are especially vulnerable to being targeted by smugglers and more and more often they simply disappear from reception centres and end up trapped in prostitution. Last, but not the least, as a long-term solution MOAS believes it is fundamentally important to spread knowledge and information about the deadly journey. According to the people we rescue, most of them are totally unaware of the dangers that they will face when they are leaving their country of origin. Many say they would not attempt the crossing again. This huge lack of information has to be addressed as soon as possible. Education plays a key role in improving the current situation, as well as investing in those countries generating the highest number of refugees and migrants. Moreover, we should explore innovative ways of eradicating the existing push factors by improving the quality of life in the countries generating the highest number of refugees. In a nutshell, our proposals are: safe and legal routes through the creation of humanitarian corridors; a better implementation of the resettlement and relocation policies and a system of shared information in the countries of origin. The 2017 CEPS Ideas Lab – a key annual event on EU policy organised by the Brussels-based think tank, the Centre for European Policy Studies – asked how such core EU challenges as Rights & Security can be implemented with respect for the EU rule of law and fundamental rights. Cooperating with openDemocracy, we bring the resulting debates to this dedicated page.